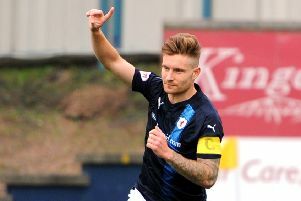 Raith Rovers captain Kyle Benedictus hopes a League One title win can make up for missing half the season due to injury. Benedictus suffered a broken leg in the 2-1 victory over Ayr United on September 9 which kept him out of action for five long months. The centre-half is now three games into his comeback and is hoping to play his part in the team clinching promotion back to the Championship at the first attempt. “It was only my second game as club captain when it happened so it was really disappointing,” Benedictus told the Press. “I saw three different people and the first told me I’d be back within six to eight weeks, but it turned out they didn’t know I was a footballer! “They thought I was in normal working job. I don’t know how that happened. “I went to see another boy and he said 10-12 weeks so I was pushing myself to that but I was still feeling it, so I saw the top specialist in Scotland and he said 18 weeks. “It’s been a frustrating time. I’ve never had an injury like it before, and it’s no good sitting in the stand watching every week. It’s a hard place to be. I’ve played a lot less games than I’d hoped, but It’s gone now and I’m just happy to be back and hoping, as a team, we can drive forward the rest of the season. Benedictus’ first game back was a 2-1 win over Airdrie but back-to-back 2-2 draws with Albion Rovers and Arbroath have been a disappointment. “Personally it’s great to be back, but that’s five goals we’ve conceded in the three games, and I’m obviously disappointed with that,” he said. “Two weeks in a row we’ve given it away in the last minute, so it’s very disappointing, but we’re a team, and we need to pick ourselves up and go again. “We just need to get back to basics at Forfar next week, which will be a hard game because they are fighting for their lives down there. Benedictus admitted that Arbroath’s 89th minute equaliser on Saturday was poorly defended. “There’s so many individual errors,” Benedictus said. “The left back has ran 60 yards, crossed the ball, and they’ve won a corner. Then we’ve not defended the cross, or the second ball, and the strike has just hit the back of my heel and went in the net. “It’s not good enough defending, and the manager has came in and told us that. “There’s a lot of experienced boys on that pitch and we should be able to see the game out. “Refereeing decisions are going against us too, although I’m not trying to make excuses, it’s our own fault as well.